Lying in the midst of the swathe of ancient broadleaved woodland that sweeps down the Wye Valley from Goodrich to Chepstow is the environmental gem of Lady Park Wood. Described by the Joint Nature Conservation Committee (JNCC) as being 'an oustanding example of near-natural old-growth structure in broadleaved woodland', this site has been the subject of studies and long-term monitoring and has provided many clues about the history of our native woodlands as well as valuableguidance on how we should conserve these habitats, which are of such value to both our wildlife and ourselves. Because the underlying bedrock is Carboniferous Limestone, the predominant mature tree species in the woods are Beech, Ash, Lime, Oak and Yew with an understory of Hazel, Dogwood, Spindle, Privet, Holly and Honeysuckle. Beneath that the woodland flora is typically dominated by Dog's Mercury, but there are also a well above average number of rare (Red Data Book) plants and close on thirty nationally scarce species growing in the woods. Leaving fallen or standing dead wood in place provides ideal habitats for fungi and invertebrates to thrive, and the Wye Valley woodlands are also home to nearly all our woodland bird species as well as mammals, which include the Dormouse (Muscardinus avellanarius) and some rare bat species. Although predominantly in Wales, Lady Park Wood, which is privately owned, is managed with agreement by Natural England. You can gain access to Lady Park Wood by walking from Fiddlers Elbow Woods, which lies to the south of Lady Park Wood. Alternatively you can walk the approximately 1.5km from Symonds Yat Rock (access to which is via a signed lane running north from the A4136) to the NNR woodland. Due to the sensitive nature of this woodland habitat, access to most of this NNR is by permit only. Contact Natural England on 0845 6003078. There are no facilities at the reserve. The nearest pubs, shops, cafés and public toilets are in Monmouth, which is about 2km from the reserve, or at Symonds Yat Services on the A40 (on the other opposite of the River Wye). All three of our native woodpeckers live in Lady Park Wood - the Great Spotted Woodpecker (Dendrocopos major), the Lesser Spotted Woodpecker (Dendrocopos minor) and the Green Woodpecker (Picus viridis), and spring is the best time to hear them if not to be lucky enough to see them. Green Woodpeckers have a loud, screaming call and they are the most easily spotted of the three as they often forage on the ground in grassy places. The Great Spotted Woodpecker can be heard tapping or drumming on the tree trunks in the hope of dislodging bugs that lurk there, but they also have a quite distinctive 'chip - chip' call. The Lesser Spotted Woodpecker, a much smaller bird only the size of a Hedge Sparrow, is the rarest and by far the most elusive of the three. It has a similar, but weaker, call to that of the Great Spotted Woodpecker but each of its 'drum-rolls' lasts longer than those of the Great Spotted Woodpecker. All the Wye Valley woodlands are good places for seeing the migrant birds that visit us in spring and summer to raise their families, and Lady Park Wood is is no exception with numerous species having been recorded there. Breeding birds include Bullfinches (Pyrrhula pyrrhula), Pied Flycatchers (Ficedula hypoleuca), Redstarts (Phoenicurus phoenicurus, Tree Pipits (Anthus trivialis) and various warblers. Two of Britain's rarest bat species live in the woods. Greater Horseshoe Bat (Rhinolophus ferrumequinum), Britain's most endangered bat species, and Lesser Horseshoe Bat (Rhinolophus hipposideros) use caves and disused mines in the area to roost and raise young. 'Horseshoe' is a reference to the extraordinary shape of the nose of these bats. The tree canopy affords the bats good cover, and the humidity caused by the proximity of the River Wye and the denseness of the tree canopy encourages a rich community of insects on which the bats feed. The concentration of Lesser Horseshoe Bats found in the Wye Valley woodlands represents 26% of the total UK population, making it by far the largest population of this species in Wales. Displays of spring flowers in Lady Park Wood and other woodlands in the area are exceptional. The Bluebell (Hyacynthoides nonscripta) season in May and early June is a really good time to go to enjoy this marvellous spectacle. Other lovely spring flowers include Primroses (Primula vulgaris), Wood Anemone (Anemone nemorosa), Ramsons (Allium ursinum) and Lesser Celandine (Ranunculus ficaria); their reappearance each year reassures us that we have also made it through another winter and that summer is on the way. Ancient broadleaved woodlands such as those at Lady Park Wood support some unusual and rare plants including Narrow-leaved Bittercress (Cardamine impatiens), Wood Fescue (Festuca altissima), Wood Barley (Hordelymus europaeus) and Stinking Hellebore (Helleborus foetidus). Tintern Spurge (Eurphorbia stricta), also known as Upright Spurge, is found in the woodlands of the Wye Valley, and so is the strange Toothwort (Lathreaea squamaria) which is devoid of the chlorophyll (green colouring) that would enable it to make its own food. Instead it feeds on dead matter found in leaf litter in woodlands. 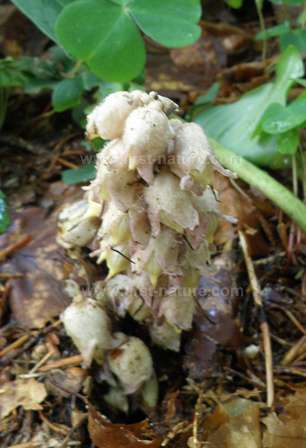 Toothwort also has a known association with Hazel trees, and this parasitic plant is often found growing on their roots. Many kinds of wild orchids are recorded in the Wye Valley area, including Early Purple Orchid (Anacamptis morio), Greater Butterfly-orchid (Platanthera chlorantha) in the more open grassy parts of the woodland, and the strange Bird's-nest Orchid (Neottia nidus-avis) which pops up through the dense leaf litter beneath mature Beech trees in June. 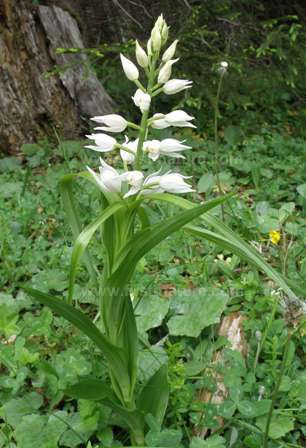 Two British rarities make an appearance here, too, Sword-leaved Helleborine (Cephalanthera longifolia) which is also sometimes referred to as Narrow-leaved Helleborine is one of them. The other is Narrow-lipped Helleborine (Epipactis leptochila). Sword-leaved Helleborine, with is lovely white flowers, is one of our most striking and beautiful native orchids although it is also one of our most endangered. This wild orchid has undergone a devastating decline over the past 200 years, which is why woodlands such as Lady Park Wood are so immensely important. The Narrow-lipped Helleborine deserves to be described as 'interesting'; otherwise 'boring' rather than 'beautiful' might be considered appropriate. The plants found in the Wye Valley represent something of an outpost for this orchid, which is more commonly found in beechwoods in the Chilterns and Cotswolds. This woodland plant is also rare, having declined considerably in recent years. 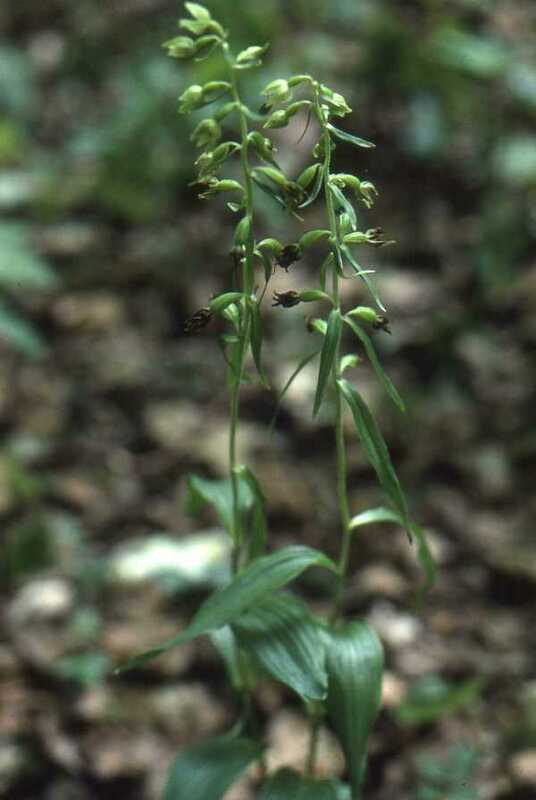 The whole of a Narrow-lipped Helleborine plant, including the flowers, is green; this makes it difficult to spot except when it is growing in open areas of brown leaf litter; fortunately such habitat is one of its classic flowering locations. The flowers are thought to be self-pollinating. 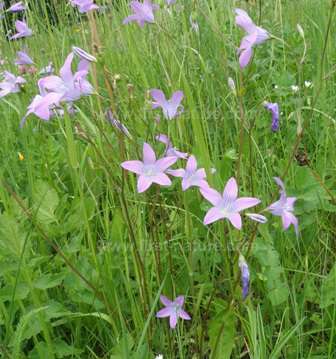 Spreading Bellflower (Campanula patula) occurs on the edges of the Wye Valley Woodlands, and although this is another wildflower whose numbers are declining, this area still represents the heartland of its small territory. Monkshood was once found on the edges of the streams in the woodlands, but it seems to have disappeared completely; however, perhaps by way of compensation, visitors to the area may be surprised to come across populations of Martagon Lilies (Lilium martagon) which are better known from the Alps in central Europe. Whether these lilies have been introduced or are native to the area is open to discussion.